Caption: Zulekha Hospital has seen a triple increase in the number of women registering for free consultations and Pap tests of the cervical cancer awareness campaign themed ‘Today is the Day’. 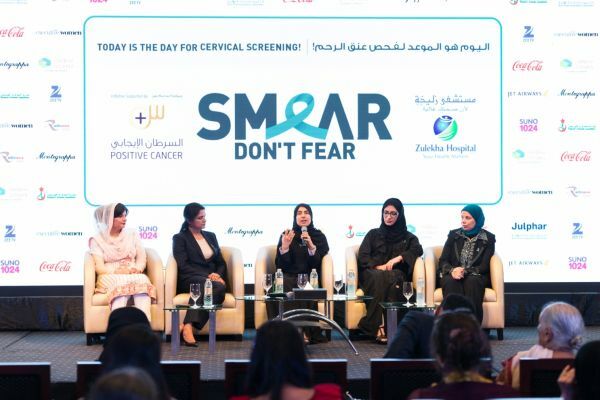 Zulekha Hospital reported a record increase in the number of female patients registered for screenings and Pap tests during its ‘Smear, Don’t Fear’ cervical cancer awareness campaign with 1.82 million UAE-based women now at risk of developing the disease. “The response we received was overwhelming as the number of women making appointments tripled since last year,” said Zanubia Shams, Co-Chairperson of Zulekha Hospital. “Cervical cancer is usually transmitted by a virus that can be completely eradicated and we want to make people realise that by vaccinating both girls and boys from as early age as nine up to twenty-six, it can be achieved. “The virus takes about 20-30 years to develop into a cancer, so there’s a wide time-frame during which women can act to fight it. Dr Layla Mohamed Al Marzouqi, Director of Health Regulation Department and the Dubai Medical Tourism Initiative at the DHA said: “I’d like to thank Zulekha Hospital and Dr Zulekha Daud for launching this campaign for the benefit of the community of Dubai and the UAE at large.